Ellen DeGeneres Reveals Which Movie Role She Stole From Jennifer Aniston! 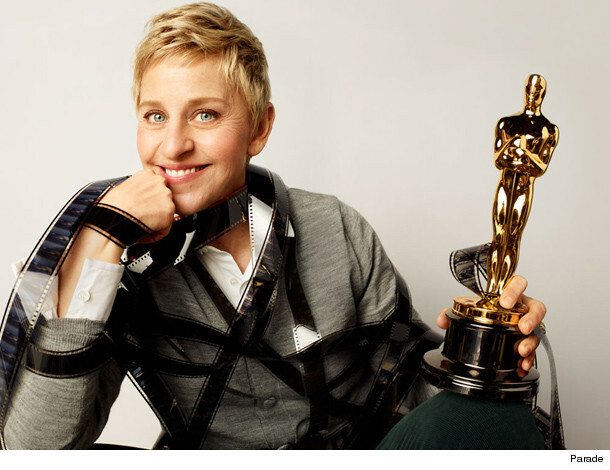 Ellen DeGeneres may be on top of the talk show game, but did you know she beat out Jennifer Aniston for a movie role? In an interview in the March 2 issue of Parade magazine, "The Ellen DeGeneres Show" host revealed that she scored the supporting role in 1999 comedy "EdTV, " despite some very stiff competition from the former "Friends" favorite. "She recently reminded me that I beat her out of that," she tells the mag. "I got the part and Jen Aniston didn't! That'll probably be the only time that happens." A year after stealing that role from Aniston, DeGeneres says she helped inspire one for another rising starlet: Oscar winner and current nominee, Sandra Bullock. "'Miss Congeniality' was written based on me," the 56-year-old revealed. "When I was getting ready to cohost the Emmys, the writer saw me [on TV] learning how to walk in a dress and heels. My stylist at the time -- a man -- was teaching me, and it was ­hilarious. The 'Miss Congeniality' writer saw it and thought it was brilliant." Ellen's next big role? Oscar host! Check back with toofab on Sunday to see the best moments from the star-studded award show, and click "Launch Gallery" above to see more stars who turned down big roles. Ellen DeGeneres Gives Jimmy Kimmel an Oscar: "I Got You a Baby Gift!"